Here is the new trailer from the upcoming film “MAZE RUNNER: THE SCORCH TRIALS.” The film is directed by Wes Ball, starring Dylan O’Brien, Kaya Scodelario, Thomas Brodie-Sangster, Giancarlo Esposito, Aidan Gillen, Barry Pepper, Lili Taylor, and Patricia Clarkson. MAZE RUNNER: THE SCORCH TRIALS hits theaters everywhere September 18, 2015! Here is the trailer from the upcoming film “MAZE RUNNER: THE SCORCH TRIALS.” The film is directed by Wes Ball, starring Dylan O’Brien, Kaya Scodelario, Thomas Brodie-Sangster, Giancarlo Esposito, Aidan Gillen, Barry Pepper, Lili Taylor, and Patricia Clarkson. Here is the trailer from the upcoming film “LAST WEEKEND”. 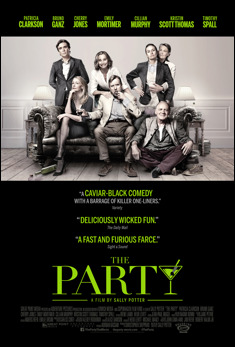 The film is directed by Tom Dolby and Tom Williams, starring Patricia Clarkson, Zachary Booth, Joseph Cross. Celia Green (Patricia Clarkson) is at a crossroads. She and her husband, Malcolm (Chris Mulkey), are the founders of a fitness empire and among San Francisco’s wealthiest citizens. They have been coming to Lake Tahoe for more than thirty years, and yet Celia now feels that something in her life is missing. She gathers her two adult sons (Zachary Booth and Joseph Cross) and their partners for a rare weekend together. As the holiday begins, Celia finds herself torn between the house—and the past that it represents—and her desire to move forward with her life. As the weekend progresses and tensions rise, the four members of the Green family are joined by an eclectic assortment of houseguests and drop-ins, young and old. On Saturday morning, an accident threatens to unhinge Celia’s meticulously devised weekend: the Greens’ longtime caretaker, Hector Castillo (Julio Oscar Mechoso), is electrocuted as he is fixing a broken light on the dock. When he is airlifted to a nearby hospital, the Green family goes along with him, and the guests on the property are forced to fend for themselves. Amidst this catastrophe, Celia must decide whether she is ready to let go of the house. LAST WEEKEND is a film about the end of an era for a family—and the steps we must often take in order to create new beginnings. Here is the new trailer from Focus Features’ upcoming film, ONE DAY. The romantic/comedy is directed by Lone Scherfig, starring Anne Hathaway, Jim Sturgess, Patricia Clarkson, Ken Stott, Romola Garai, Rafe Spall.